A look at where you can find all 6 collectible Souvenirs in Life is Strange 2: Episode 1. In Life is Strange 2: Episode 1, there are 6 collectible Souvenirs you can find hidden in a variety of different locations. Souvenirs can be anything from keychains to stickers, and due to their small size, can be easy to miss if you don’t know where to look. Before you begin playing Life is Strange 2: Episode 1, it’s worth jotting down the locations of these 6 Souvenirs so that you don’t miss them the first time around. To help, we’ve put together a quick guide featuring the locations of all 6 collectible Souvenirs found in Life is Strange 2: Episode 1. You can view the Souvenirs you've collected by opening up your bag in Life is Strange 2: Episode 1. As stated above, Life is Strange 2: Episode 1 has 6 collectible Souvenirs hidden throughout the game. These items are often small, such as stickers and keychains, making them easy to miss if you don’t know where to look. When you find a Souvenir, interact with the item, then select the “Take” option to collect it. Below, we’ve listed the locations of all 6 collectible Souvenirs in Life is Strange 2: Episode 1. Souvenir 1, Fishing Bait: The first collectible Souvenir in Life is Strange 2: Episode 1 can be found early on when Sean and Daniel are camping out by the river. When you’re prompted to collect logs to build a fire, head to one of the trees at the far edge of the camping area. On the tree, you should be able to spot the Souvenir, Fishing Bait, hanging from one of the branches. Souvenir 2, Bird Feather: The second collectible Souvenir in Life is Strange 2: Episode 1 can be found once you reach the gas station. While here, you’ll want to head to the back and interact with a pile of firewood near a jack-o-lantern. There, you’ll find a small box in the area between the jack-o-lantern and firewood that you can interact with. Select “Move” to push it out of the way. In doing so, a bird will be startled into flying away, leaving the Bird Feather collectible Souvenir behind. Souvenir 3, Bear Keychain: The third collectible Souvenir in Life is Strange 2: Episode 1 can also be found in the gas station. After collecting the Bird Feather outside, head into the gas station and approach the counter. There, you’ll spot a keychain display to the left of the cash register. Select the “Show” option and you’ll be able to get the Bear Keychain collectible Souvenir for free. Souvenir 4, Trucker Sticker: The fourth collectible Souvenir in Life is Strange 2: Episode 1 can, once again, be found in the gas station. 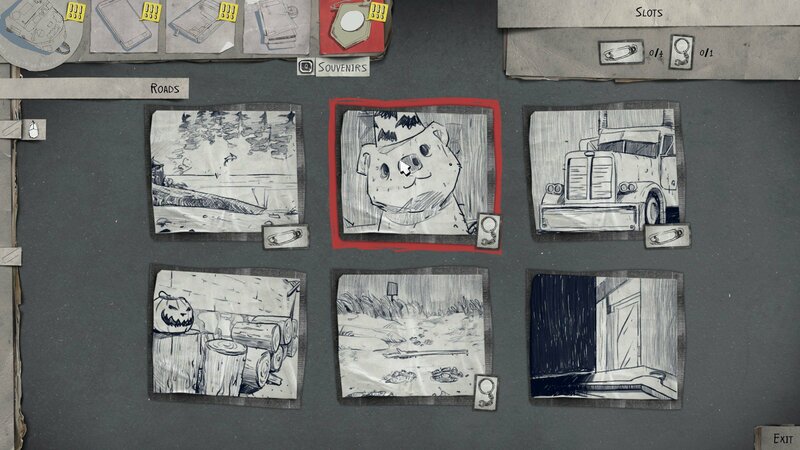 After you collect the Bear Keychain collectible, head over to the window near a Halloween ad and a fire extinguisher. There, you should spot stickers on the windowsill. One of these stickers will let you interact with it, and by selecting the “Take” option, you’ll be able to acquire the Trucker Sticker collectible Souvenir. Souvenir 5, Shark Tooth: The fifth collectible Souvenir in Life is Strange 2: Episode 1 is spotted later on when you reach the Three Seals Motel. There, you’ll encounter a dog which you can play with. After playing with the dog and throwing the dog’s stick towards the ocean, the dog will fetch and with the Shark Tooth Pendant collectible Souvenir. Souvenir 6, Three Seals Card: The sixth and final collectible Souvenir in Life is Strange 2: Episode 1 can also be found at the Three Seals Motel. Once you’re inside the room, sift through the closet. On the right side of the closet, you’ll stumble across the Three Seals Card collectible Souvenir. As with previous Life is Strange installments, finding all of the game’s collectible items boils down to exploring each area thoroughly and interacting with items to learn more about them. Be sure to check back, as we’ll be posting additional collectible Souvenir guides as new episodes of Life is Strange 2 are released. In the meantime, were you able to find all 6 collectible Souvenirs? Which one was the hardest to find? Let us know down in the comments below! By reading through this guide, you should now know the locations of all 6 collectible Souvenirs in Life is Strange 2: Episode 1.